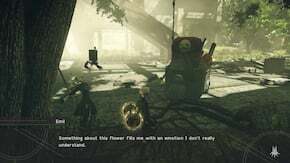 Emil's Memories is a Side Quest in NieR: Automata. "You happened upon Emil admiring the lunar tears around the commercial facility. He said they brought back memories, and also filled him with an emotion that he couldn't quite describe. He then asked you to find more lunar tears somewhere in each region, hoping that they might help him understand his feelings." "At last, Emil remembers everything - including a place that was very important to him. In gratitude, he offered to show you his special place and gave you a key to the elevator in the commercial facility. He wil be waiting for you in the basement." "After you found a wide space covered with lunar tears in the basement of the commercial facility, Emil appeared and told you of his life. He was built long ago as a weapon, and he himself was but one of many copies produced during the war against the aliens. He said that the place you were standing was very dear to the original Emil who had lived so long before. Your Emil then wistfully explained how echoes of that memory lingered on inside him." This quest unlocks after you have met Emil and completed the quest The Forest Kingdom. Travel to the desert entrance in the City Ruins after asking Pascal about A2. Shoot Emil, talk to him, and the flower will be present in the next step. Travel to the City Ruins: Near the Tower access point and towards the Commercial Facility on the way to Forest Zone. You will see a shining flower on the ground floor of the facility. Interact with it and Emil will appear and begin the quest. Amusement Park: In the corner near the Item Shop of the area. Desert Zone: Travel to Desert: Camp and go into the desert. Keep to your right as you enter until the path opens to go down into some caves. Walk down until you reach the heart of the caves, and when the camera angle changes and moves on the top of you, keep the bottom-left direction and follow the caves in a large U-Turn, until you come out in a new area. Take some steps ahead and then turn back and climb the rocks on your right. Keep going, drop down an edge on soft sand and keep walking until you come to another edge. Across the gap, there's a shining item. Use Jump > Evade > jump to reach the item, then do it again towards the area marked on the map. You will finally drop down to the area with a Locked Chest and the Moon Tear. Forest Zone: Travel to the Center access point. Go down until you find the river and follow it down and turn a right to go into a cave before the big waterfall. Down the lift, Emil will share his story and give you your reward. Nearby, you can pick up Gold Ore, Animal Bait and G, as well as a Locked Chest with Archives: Project Gestalt Report 10. As 2B quest must be done before fight with Grün. Can't be done with A2 or in Route C. Try initiating the quest during the first sub-chapter of chapter 7. THANK YOU! With your help, I managed to find the Lunar Year in the Desert. The quest is bugged but can be fixed. Simply start from the beginning of the chapter where you talk to pascal. It will trigger the lunar tear to be interactable. If starting on 7-2 it seems the event doesn&apos;t trigger properly. I&apos;m now on route C, been trying to trigger this quest since route A without success. I&apos;ve been talking to Emil since route A and I&apos;ve received and read the Way Bored email, but doesn&apos;t make a difference. Whenever I talk to Emil he&apos;s only trying to sell me stuff. One anon said something about receiving a call from 6O about a Lunar Tear, I don&apos;t remember ever receiving this call. I think this quest glitched out on my playthrough for some reason. For the record: Do both Emil&apos;s Memories and The Wandering Couple BEFORE talking to Anemonie to trigger the main story line quest to go to Flooded City. Triggering the main quest will make both of the former quest unable to be finished. 3. Go to the shopping mall near the tower and interact with the lunar tear. You can also see kaine&apos;s painting of her grandma in the house, its about as crude and ugly as it was described in nier 1. I had massive chills running down my spine when i realized what it was. Don&apos;t know if this is common, but the quest seemed to glitch for me. I got the elevator key on the first playthrough but didn&apos;t finish the quest. Now the quest tells me I already have the elevator key when I should be getting it and I can&apos;t use the elevator. The quest disappears from my quest log and I can inspect the first lunar tear again to restart the quest, but can&apos;t inspect any of the other lunar tears. Currently stuck. Going to next new game plus soon to see if it&apos;ll reset it properly. Does anyone know if i am able to start this AFTER getting ending B? Am i too late?